We’re at it again- this time we went up against a wide variety of bench grinders. People use them for grinding, sharpening, deburring and polishing tools. They come in handy because they make other tools more efficient. Because of this we decided to find the best ones in the market. We did the usual intense evaluations of as many models we could get our hands on. We tested a wide variety of tools made of a wide variety of metals on each grinder to see which ones performed the best. Here is our official list of the best grinders on the market—we have a top three and our one budget pick. 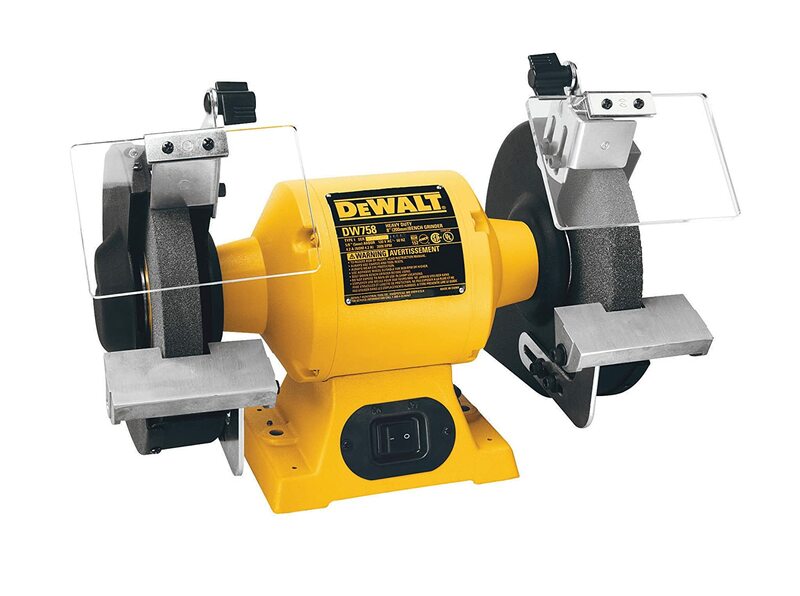 Our number pick for bench grinders is the Dewalt DW758 8-inch bench grinder. We loved its sturdiness, design and overall ability to get the job done. It’s our gold pick for good reason—it stood out and performed the best. Keep reading to find out how it won us over! We loved the configuration of the Dewalt grinder. It works on a ¾-HP induction motor that gives a lot of power to handle pretty much any grinding need. It runs at 3,600 RPM. We loved how rugged this machine was and how much it was able to do. It has rear exhaust ports for smooth operation and a cast iron base. No matter what project you are working on, it supplies sturdy support as you work. The tool rests on the machine are aluminum and help you to keep items steady for the most accurate results possible. There is 12 ½-inches between the grinding wheels. You can easily handle any grinding or deburring with this machine. It also can keep all of your industrial-intended blades sharp, remove rust, polish, and shape chisel ends. Overall this is a great tool to have in any workshop and that’s why we promoted it to the number one bench grinder we tested out. We also really loved that Dewalt chose to put the cast iron base on this machine. A lot of the models we reviewed didn’t have that sturdy foundation to work with. As we tested stronger gritty metals, the machines moved. We wanted to find the grinders that not only did the job, but were the utmost in reliability on all fronts. The Dewalt’s cast iron base dares you to bring on the biggest most difficult job you have. We had a few particularly rusted chisels and after a few minutes of working on them with the Dewalt grinder, they were this-close-to looking brand new. The tool rests on this Dewalt model also deserve some conversation. As stated they are aluminum. The value of this is that it allows you to steady anything you rest on them, even while heavily grinding it. We can’t say enough about how well the ledges worked for us when we used a variety of tools. Whether we put big or small items on the rest, it made working much easier. It allowed us to control the grinding angle and amount. We were very happy with this added feature and how well it performed. Also, the 30- and 60-grit wheels were perfect to get any job done precisely and quickly. Dewalt backs their DW758 grinder with a 3-year warranty covering any defects. It also covers a 1-year service warranty. We always like it when manufacturers are on the customer-service bandwagon and go the extra mile to help their potential buyers make the most of their products. The service warranty was a great example of how a manufacturer can show that they 1) believe in their product and 2) want to truly help the customer. It also speaks to us because we try our best to present only the highest-quality products to our readers. This Dewalt grinder weight 40 ½-pounds, which was very reasonable considering what a work horse it is. In fact, we thought it should by all accounts weight a lot more considering all it could do during our testing phase. Its dimensions are 17.8-inches by 12.6-inches by 10.8-inches. Included in the box with the grinder are 36- and 60-grit wheels, spark deflectors, eye shields, and tool rests. This definitely is the complete package Dewalt is supplying – which is another reason why they rank so highly with us. We are excited to find stand-out products and the Dewalt DW758 definitely didn’t disappoint us in any way. It’s sturdy. It’s effective. It’s efficient. It’s a great design. What more can we ask for? Nothing—and it definitely earned its place as our number one grinder in the market. 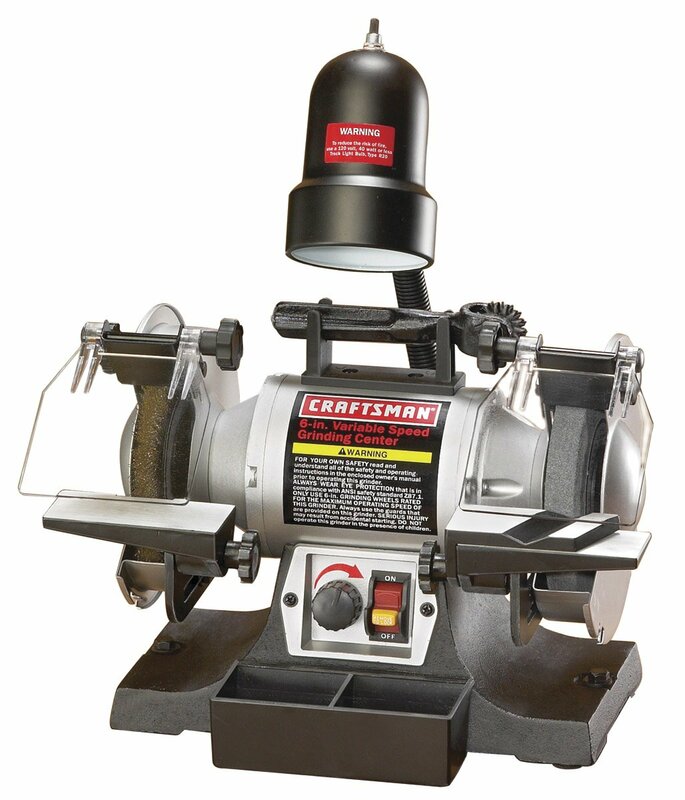 Coming in second on our list of the best bench grinders is the Craftsman 9-21154 Variable Speed 6-Inch grinding center. The power, attention to safety, and efficiency of this grinder is what won us over. Here’s what we found during our evaluation. Primarily, this bench grinder took second place due to its design and power. First of all, it works on a 1/5-HP motor at 2.5amps and adjustable speeds. You can run it at 2,000 or 3,400RPMs. We really liked the choice of speed with this machine. It makes grinding that much more efficient because you can pick the exact amount of power you need. For example, with smaller items or more delicate items we used the lower power range to control the results more precisely. With bigger more rigorous grinding, we upped the power to finish the job as quickly as we could. Regardless of what power level though, we got the outstanding results we wanted. The Craftsman was able to deliver, and that’s what put it at our number two spot. What stood out about this Craftsman was its patented attachment for sharpening bits. We tested out a wide variety of bits we had laying around –old and new, rusted and clean— to make sure that each was easy to handle and efficiently sharpened. Happily the Craftsman patented attachment served us well. It did the job and made it a little easier. The Craftsman weighs 30.3-pounds and its dimensions are 15-inches by 12.6-inches by 12.2-inches. Just like our number one pick, that makes it very versatile and convenient. You can station it in a wide variety of areas because of its moderate size. It is lightweight by all accounts as compared to what it can do. When we look at heavy-duty machinery we always try to find size/weight-efficiency. What if the machine needs to be transported to jobsite? Or what if a carpenter wants to move it in his workshop? We want it to be easy to change location without assistance. That’s exactly what we found with all of our top model bench grinders. This grinder also comes with a lot of safety features. It has wide and clear eye shields to protect users. The spark guards are hefty. We liked the fact that the manufacturer put considerable time into adding to the safety of the machine. Any time you work with a large and powerful machine like this, safety should be a primary concern. The fact that the manufacturer agrees and did something about it, is a definite advantage that earned a lot of brownie points with us when we evaluated the market. Manufacturers of the Craftsman supply it with a 1-year warranty. Though we hoped for a longer timeframe due to how long buyers expect large tools like this to last, one year was sufficient considering that it covers service. This is the main customer concern with bench grinders so we were satisfied. Included in the Craftsman purchase is a convenient large work light with an independent switch for on/off. This was a great addition that we appreciated. When doing precision work, it helps to be able to focus the light and see exactly what we were doing. It is additional features like this that help to push certain products up our list of “the best”. We love it when manufacturers truly think about what would service their end-users best and include it as a standard part of the package, with no extra charge. The full package is the bench grinder, the light, one wire wheel and one grinding wheel. We particularly liked the wire wheel’s durability. It allowed us to polish, deburr and clean a wide variety of tools efficiently, restoring them to almost-new quality. In the end, the Craftsman impressed us enough to make it to our second place spot on the list. It is powerful, efficient and easy-to use tool. We loved its user-friendly model that was built for power and safety. 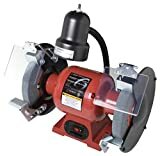 If you need a bench grinder, be sure to check this one out. It truly is a great product that will give you years of efficient results. Our bronze pick for bench grinders went to the Sunex 5002A Bench Grinder with light, 8-inch. This is smaller machine, but much like our bonus buy pick, it still provides a lot of power and can efficiently get just about any job done. Here’s why we chose it to round out our list of top three bench grinders. The Sunex 5002A has a powerful motor for its size. It runs on ¾-HP and 3,450RPM. That means that larger jobs are still manageable despite its size. It has enough in RPM to do anything. We tested it with the same materials that we tested our bigger model grinders. We wanted to make sure it could polish, sharpen and deburr with the best of them. We were happy with the Sunex performance. Time and time again it did exactly what we needed with minimum effort. There are a lot of features put into this bench grinder to make it more efficient. One is definitely the motor, but another is the cast iron base. Like our top pick, the cast iron base makes it a solid machine that isn’t going to move regardless of what work load you put on it. An added bonus with the Sunex is its mounting holes and rubber feet. You can easily station it and secure it to a work bench or table anywhere you want without fear of it shifting during use. This was a plus with us. It means that working with it can be that much easier and more efficient. If you don’t want to secure it using the mounting holes, the rubber feet on the heavy base are enough to keep it steady. We tested this out thoroughly and it never moved during use. What we liked about the Sunex grinder was that it stood up to our testing. The company itself though is known for doing heavy quality testing of their machines and holding a high standard of performance for all tools. We loved the fact that this machine came with an already-great reputation for excellence and stood up to our evaluation to prove it. It has a 1-year warranty too so you’ll be able to maintain the machine with help from the manufacturer if any problems arise. The Sunex 5002A weighs 36.6-pounds. Its dimensions are 16-inches by 14.2-inches by 10.8-inches. It is weighty but compact. It comes with a bright work like. In fact, the light on this model is one of the brightest we found. It also has an easily adjustable neck, so you can point the light to whichever side you need. You can also easily adjust the entire lighting mechanism thanks to a flexible ribbed neck. That makes working on detailed jobs that much easier. You can also adjust the spark guard and the adjustable eye shield. The added safety features were a definite plus with us. They are on each side by each of the two wheels. The wheels are 8-inches in diameter and come with a 36-coarse grit and a 60-medium grit. This is perfect for grinding any item in your workshop whether you need it sharpened, polished, deburred or buffing. This compact machine can handle all of your needs. This grinder also has a convenient tool rest made out of aluminum. We found that this was a great addition to help stabilize smaller objects for grinding. We also liked the on/off switch at the base. It was easy to see and easy to use. It was built with a clear red-side and green-side for off and on functions, respectively. If you are in the middle of an intense job having the ability to turn the machine off completely without fumbling for a switch is an advantage. It also comes with a lengthy 6-food power cord, so you should be able to station it conveniently anywhere you need. 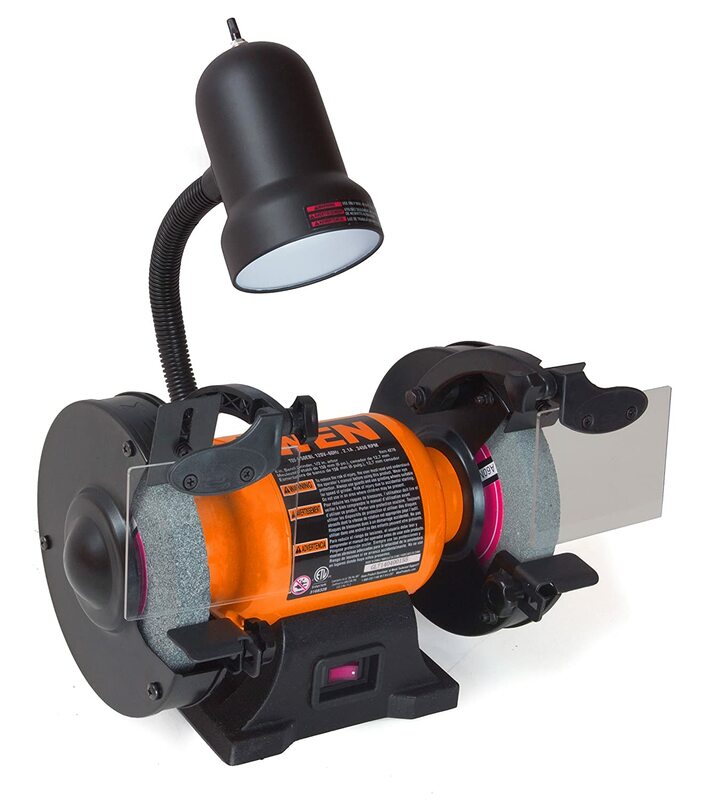 The Sunex 5002A is a great bench grinder. It has power, flexibility and extra features that will help you finish any grinding, polishing or buffing job that much quicker and efficiently. It easily made it to the number three product on our list of best bench grinders available today. On our lists we always come up with a budget pick. This place goes to the WEN 4276 6-Inch bench grinder. It’s smaller than and not as obviously powerful as our other models, but as a budget pick, it is a fantastic option. The WEN 4276 has a 2.1amp motor that runs at 3,450RPMs (no load.) Each wheel is 6-inches by ¾-inch. Though it is smaller in stature, we found that it held up to all of our testing just fine. In fact, it impressed us with its capabilities. At just 16-pounds this is one of the lightest bench grinders in the market. Don’t let that fool you though. This is probably the biggest advantage. What we liked the most about this grinder is its size to power. Though it is light, it still handled all of our grinding needs relatively easily. We first tested it out with sharpening different size blades. Each one was easily restored to factory-like sharpness. We also tested out this small grinder with deburring and rust removal. Both were easy and done quickly. All of the testing we did with larger models, we did with this one. Though some larger models were felled by our hefty use, the WEN stood up time and time again. Like our other models the WEN 4276 has two wheels. One is a course 36-grit wheel for quicker jobs. The other is a 60-grit wheel for general purpose grinding jobs. We found that the two different wheels armed with different grit-levels was perfectly executed on the frame. Speaking of frame, its dimensions are 14-inches by 9.8-inches by 15-inches. This makes for one of the most easily moveable grinders on our list of test grinders. If you move from location to location and need your grinder to travel with you, this one is perfect. Or, if you like to remodel your workshop periodically, this is a grinder that can easily be re-stationed to a more convenient area quickly. It will only take one person to move this and it’s quicker than ever to reposition. WEN provided this bench grinder with a 2-year warranty. Again, we appreciate manufacturers who want their products to last a long time for the end user, and are willing to stand behind them. This 2-year warranty is a sign of long-term dedication. It comes with a toll-free number for assistance and a national service network that can serve any customer need. It was another reason why this bench grinder was nominated as our budget buy for this list. We also loved the motor on the WEN bench grinder because of how quiet it was. It may have been how long we were testing, but we expected all of our grinders to come with a louder buzz. We were happily surprised when we started this one up and got a very light hum. Sure when grinding various tools it was a little louder, but it was due to no fault of the actual grinder. We loved how quiet it was when the motor was on and when it was working. There are some added features that made this WEN model worth a final nod on our list. One is the convenient work light included. It has an adjustable neck so you can position it and point it to wherever you need light most. This was a handy tool that gave the machine a few extra bonus points during evaluation. The model also comes with eye guards for safety. As with the light, the eye guards are adjustable so you can position them any way you need to as you work. Overall, the WEN 4276 is a great bench grinder for its size. It is able to manage all of your grinding needs. It can deburr, polish, and sharpen with the best of other and bigger models. If you need a grinder, but not necessarily a full-time machine, consider this one. For its price, it’s a great find! When it came to our pre-purchase considerations with bench grinders, we decided that the motor and power would be a primary concern. Next to that was the size and size-to-power ratio. Then we looked at the safety features and extras. Here are details on what we were looking for when doing our evaluations. Our primary concern with bench grinders was the motors included in the models we looked at. We wanted motors that could stand up to continuous use, even if they didn’t have to. We always consider our readers and how diverse they are. We have some readers who are Saturday-afternoon tool guys and gals. They use tools as a hobby to take care of small projects around the house here and there. We also have readers who are professional contractors who handle industrial-sized jobs. They need the most durable and efficient products available. To them, time is money and a good machine can save both. When we do our evaluations we want to take both markets into account. With this tool, we applied this way of thinking for a diverse market. We wanted the motors that could easily keep up with both the here-and-there tool user to the professional. We also wanted to make sure that every motor could handle any job—whether it was grinding, polishing or deburring. A good bench grinder can do it all and each one of our selections was able to keep up nicely. When it comes to doing its jobs of grinding, polishing or deburring, we wanted to make sure that every machine we evaluated could complete them. We wanted the machine that were great at whatever we needed. We took a variety of different tools, bits and metals and tested each. We didn’t want a machine to be good at grinding but not at deburring. Or, a machine that was great at deburring, but couldn’t handle polishing. When we look for machines, we always want to find the ones that are excellent at all their intended purposes- and not just one. With our chosen top three and the budget pick, the machines were able to handle every requested task we put them through. This is why they made it to our list. We also used a variety of metals on each machine to ensure that performance was never an issue. The machines that couldn’t stand up were immediately vetoed so we were left with truly the best bench grinders out there. We also looked at the safety features of each one. With large machinery safety should always be a standard manufacturer concern. There is the obvious safety features that come with machines, but good manufacturers spend extra time building in additional safety. With grinders sparks are always a concern. Having a sturdy and adjustable spark guard is a necessity. Happily, all of our top picks came with hefty guards that warded off all sparks we created during intense testing. We also looked at any additional features manufacturers chose to build into the products. A light is a nice extra. Not all grinders come with them and the ones that did earned extra points during evaluation from us. They got even more points if the lights were easily adjustable by the necks. We also considered extended warranties an extra feature. Ideally a machine will last a long time and perform well for years, but what if it doesn’t? We wanted to know that the manufacturers would stand by the machines and the customers. Finally, we looked at the size of all of our machines. We wanted sturdy machines that weren’t bulky. We wanted a streamlined construction. Part of our purpose for this was for the worker who needs to transport the bench grinder to a worksite. They can’t have a huge machine that needs multiple people to reposition it. We also were considering the workshop that needs to move machines around from time to time. Again-being able to do so without a lot of added effort was a priority. Each one of our machines is sturdy but can be moved relatively easily. In the end we are happy with our list of top rated bench grinders. We tested each one of them intensely for power, ease of use, safety extras and size-to-power to make sure that they were truly stand-outs. If you need a bench grinder, our list is a great place to start.